It makes sense to be enthusiastic about putting in a Tankless Water Heater in Tempe, AZ. After all, your electric (or gas) bill is about to plummet because of your increase in efficiency (paying to keep that tank of water hot all the time is one of the biggest pieces of that bill each month). Using less power is also a boon for the environment, so it's a real win-win. Let's look at some tips to help you pick the right heater for your home. Consider how much hot water you need at one time. If you purchase a small Tankless Water Heater in Tempe, AZ, that can support a bathroom and a dishwasher running in your kitchen. How many faucets do you want to run at the same time? What are the flow rates of your various fixtures? If you ask your plumber to come by and help you figure this out, it is worth the price of a service call to get the right answer. Don't forget the washing machine and the dishwasher. Did you know that some washing machines (such as the Asko washer/dryer) just need cold-water hookup and heat the water themselves? That's huge because it takes the load off your hot water heater. Take a look at how your appliances work when understanding your hot water load. Manage the contractor -- not the other way around. A contractor who is working on a quick timetable may not want the hassle of bringing in a tankless system for your home. If that's the case, find a new contractor. You're the boss of the situation, and you're the one paying for the home -- and the one who will be living in it. 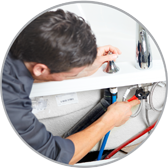 For installation Tankless Water Heater in Tempe, AZ instructions are often available online. Provide the contractor with the directions, and communicate your expectations.